The goal of this study was to determine a predominant cell type expressing fractalkine receptor (CX3CR1) in mature ovarian teratomas and to establish functional significance of its expression in cell differentiation. 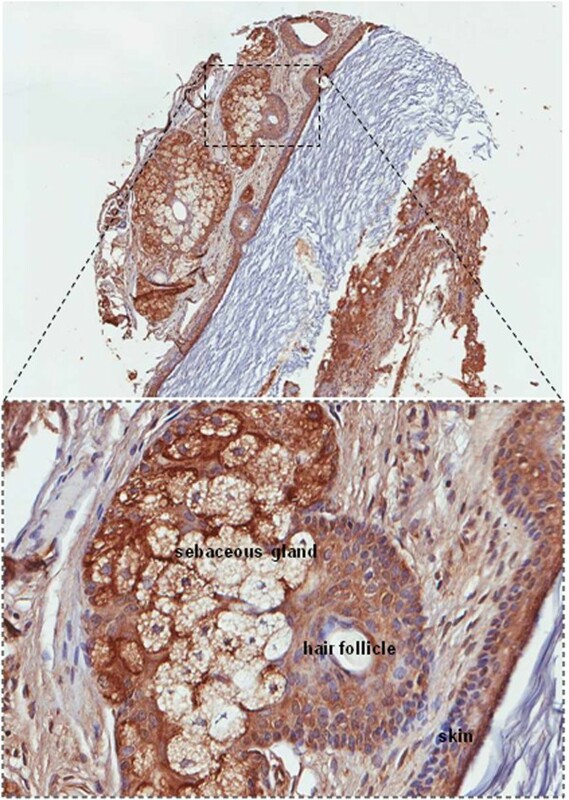 Specimens of ovarian teratoma and human fetal tissues were analyzed by immunohistochemistry for CX3CR1expression. Ovarian teratocarcinoma cell line PA-1 was used as a model for cell differentiation. We found that the majority of the specimens contained CX3CR1-positive cells of epidermal lineage. Skin keratinocytes in fetal tissues were also CX3CR1- positive. PA-1 cells with downregulated CX3CR1 failed to express a skin keratinocyte marker cytokeratin 14 when cultured on Matrigel in the presence of a morphogen, bone morphogenic protein 4 (BMP-4), as compared to those expressing scrambled shRNA. Here we demonstrate that CX3CR1 is expressed in both normally (fetal skin) and abnormally (ovarian teratoma) differentiated keratinocytes and is required for cell differentiation into epidermal lineage. Ovarian teratoma (dermoid cyst) is a benign tumor originating in germ cells. This tumor is one of the most common germ cell tumors and accounts for up to 20% of all ovarian cysts . Ovarian teratoma is the most common tumor associated with pregnancy . Generally, ovarian teratomas are cured by a complete surgical resection; however, some cases could give rise to a malignant disease [3, 4]. Ovarian teratomas could be of both homozygous and heterozygous origin, as well as the mixture of the two, and it has been previously suggested that several mechanisms could lead to their development, including failure of meiosis I, failure of meiosis II, or duplication of a mature ovum . Mature ovarian teratomas often contain a mixture of fully differentiated tissues from all three cell layers, ectodermal, endodermal, and mesodermal, resulting in formation of skin, hair follicle, sebaceous gland, bone, teeth, thyroid, and other cell types [6, 7]. Our previous data obtained using a limited number of subjects suggested that a chemokine receptor fractalkine (CX3CR1) is expressed in ovarian teratomas . CX3CR1 is a G protein-coupled receptor with multiple functions in both the normal state and disease [9, 10]. CX3CR1 is activated by its highly specific ligand fractalkine (CX3CL1) . It has been shown that CX3CL1/CX3CR1 axis plays a role in differentiation of osteoclasts  and development of dendritic cells , but its role in skin differentiation has not been described. The goal of this study was to determine the predominant type of CX3CR1-positive cells in ovarian teratomas. We also aimed to determine whether the same cell type(s) are CX3CR1-positive during the normal development. Lastly, using a cell culture model, we intended to establish whether CX3CR1 expression is required for cell differentiation. Tissue microarray (TMA) slides containing specimens of ovarian teratoma (Cat# OV805) and specimens of human fetal tissues (Cat# BE01014) were obtained from US Biomax (Rockville, MD). Because these specimens were commercially available and were deidentified, no approvals by the Institutional Review Board were required. GFP-tagged CX3CR1 shRNA and scrambled shRNA constructs were obtained from Origene Technologies (Rockville, MD). DharmaFECT was obtained from Dharmacon (Lafayette, CO). Matrigel was obtained from BD Biosciences (Bedford, MA). Mouse monoclonal CK14 and CK18 and rabbit polyclonal CX3CR1 (Cat# ab49747, ab49824, ab8021 and ab8020, respectively) antibodies were obtained from Abcam (Cambridge, MA), and mouse monoclonal β-tubulin antibody was obtained from Developmental Studies Hybridoma Bank (Iowa City, IA), goat polyclonal CX3CL1 (Cat# AF365) was purchased from R&D systems (Minneapolis, MN), and mouse monoclonal actin antibody was purchased from Santa Cruz Biotechnology (Dallas, TX). Vectastain ABC and DAB kits were obtained from Vector Laboratories (Burlingame, CA). BMP-4 was purchased from Invitrogen (Carlsbad, CA). Ovarian teratocarcinoma cell line PA-1 and ovarian carcinoma cell line SKOV-3 were obtained from American Tissue Culture Collection (Manassas, VA). PA-1 cells were plated on Matrigel-coated (at 1/100 dilution) tissue culture plates or glass cover slips at 5% confluence and cultured in minimal essential media supplemented with sodium pyruvate and non-essential amino acids for 2 weeks. Cells subjected to differentiation into skin lineage were cultured in the above described media containing 10 μg/ml BMP-4. TMA slides were deparaffinized by baking at 60°C for 2 h and rehydrated by incubation in xylene, 100% ethanol, 95% ethanol, 70% ethanol, and phosphate buffered saline, pH 7.4, for 5 min each. Peroxidase activity was inhibited with hydrogen peroxide. Antigen retrieval was performed by 15 min incubation in 1 mM ethylene diamine tetraacetic acid (EDTA; pH 8.0) at 95°C. Prior to primary antibody staining (1:50 dilution, rabbit anti-human CX3CR1, Abcam Cat# ab8021, 1 h at room temperature (RT)) non-specific binding was blocked by incubation with 10% goat serum for 1 h. The biotin-conjugated goat anti-rabbit secondary antibody was used at a 1:200 dilution for 30 min at RT. The Vectashield ABC kit was used as directed by the manufacturer, and tissues were incubated for 45 min at RT. The DAB reagent was prepared as instructed by the manufacturer and applied to tissues on TMA slides for 2 – 10 min until brown color developed. TMAs were stained with hematoxylin, dehydrated in 50%, 70%, 95%, and 100% ethanol, and mounted with Permount. Pancreatic cancer tissue was used as a positive control. Staining was evaluated by A.K.-B. and L.R., who were both blinded to the experimental outcomes of the study. Staining was scored based on the intensity and percentage of positive cells. Intensity of staining was “0” for negative samples, “1” for weakly positive samples, “2” for moderately positive samples, and “3” for highly positive samples. Overall scores were derived as the intensity score multiplied by the percentage. Staining was assessed separately in the cytoplasm and the membrane. PA-1 cells were cultured to 80% confluence and transfected with either CX3CR1-specific GFP-tagged shRNA construct or scrambled GFP-tagged shRNA construct (Origene Technologies) using DharmaFECT according to the manufacturer’s instructions. Selection of the clones was performed with puromycin and green fluorescence as suggested by the manufacturer. Cells were cultured on glass coverslips to 50-70% confluence, fixed, permeabilized with 0.01% Triton X-100, and blocked in goat serum. Mouse monoclonal CK-14 (Cat# ab49747) antibody was used at a dilution of 1:50. Cells were incubated with the primary antibodies for 1 h at room temperature (22°C). The cells were then incubated with secondary Alexa555-conjugated anti-mouse antibodies (1:500) for 1 h at RT in the dark. 4’,6-Diamidino-2-phenylindole (DAPI) was added to the secondary antibody solution to a final concentration of 10 μg/ml 10 min prior to the end of the incubation period. Cells were washed, air dried, and mounted on glass slides using ProlongGold (Invitrogen, Carlsbad, CA). Fluorescent imaging was performed using a Zeiss AxioObserverD.1 fluorescent microscope. Western blotting analysis was used to detect the expression of CK14, CK18, CX3CR1, CX3CL1, actin, and β-tubulin in PA-1. This procedure was performed as previously described [8, 14, 15] Antibodies were used at the following dilutions: 1:500 mouse anti-human-CK14 or CK18, or CX3CL1, rabbit anti-human CX3CR1 (Abcam ab8020) and 1:200 mouse anti-human-β-tubulin or goat anti-human actin in 3% BSA in a solution of 50 mM tris-buffered saline, pH 7.4, 150 mM NaCl, and 0.05% Tween-20 (TBST). Immunoreactive bands were visualized with anti-(mouse-IgG)-peroxidase, anti-(goat-IgG)-peroxidase, and anti-(rabbit-IgG)-peroxidase (Sigma, St. Louis, MO) (1:1000 in 3% BSA in TBST), and enhanced chemiluminescence was read using Chemidoc (Bio-Rad) and Bio-Rad Chemidoc ImageReader software. According to our previous observations CX3CR1 was expressed in cells comprising ovarian teratoma tissue specimens , although the number of specimens was very limited in order to be able to draw any conclusions. In the present study we aimed to expand this observation on a larger number of ovarian teratoma specimens and determine the predominant cell type(s) positive for CX3CR1. Thus, we tested expression of CX3CR1 using a tissue microarray containing 68 specimens of mature ovarian teratoma, 10 specimens of immature teratoma, and 2 cases of monodermal teratoma. Interestingly, we have found that skin keratinocytes represent the most predominant CX3CR1-positive cell type, which was present in 38% of tested cases of mature ovarian teratoma (Table 1, Figure 1). The next most common CX3CR1-positive types of cells in the tested cases of dermoid cyst were those comprising the pilosebaceous unit of the skin assembled of sebaceous gland and hair follicle (Table 1, Figure 1). Other CX3CR1-positive cell types in the order of diminution included lymphatic, apocrine, adipose, thyroid, respiratory epithelial, peripheral nervous, endothelial, and eccrine (Table 1). Cases of tested immature ovarian teratoma were characterized by the presence of CX3CR1-positive brain, lymphatic, respiratory epithelial, adipose, and sebaceous cells (Table 1). Two tested monodermal teratomas consisted of CX3CR1-positive thyroid and lymphatic tissues, respectively (Table 1). Thus, our data suggest that skin keratinocytes are the predominant type of CX3CR1-positive cells in the tested specimens of mature ovarian teratomas. CX 3 CR1 is expressed in human ovarian teratoma. Specimens of ovarian teratoma were examined for CX3CR1 expression by immunohistochemistry. Brown – CX3CR1; blue – hematoxylin. Images were generated using an Aperio ScanScope digital slide scanner. Magnification – 5×. A region outlined by a dotted line is shown at 20× magnification. Cells of the sebaceous gland, hair follicle, and skin are indicated. * Intensity was graded in the scale from 0 to 3; 0 - no staining, 1 - weak staining, 2 - moderate staining, 3 - strong staining. ** Location of the CX3CR1 staining was cytoplasmic (C), nuclear (N), and membranous (M), as indicated. *** Percentage of CX3CR1-positive cells is indicated. Further we wished to determine CX3CR1-positive cells undergoing the normal development. We tested both male and female fetal tissues aged 5 months in utero. We found that the majority of epithelial cells, including skin keratinocytes, were CX3CR1-positive (Table 2). Hence, CX3CR1-positive skin cells are present not only within abnormally differentiated tissues, such as mature ovarian teratomas, but also in the normally developing skin. * Information obtained from the manufacturer (US Biomax; Rockville, MD) for the multiple organ fetal tissue array BE01014; TMA contained triplicate cores (26cases/78cores). ** Intensity of staining was scored as negative (0), weak positive (1), moderate positive (2), and strong positive (3). *** Denotes percentage of positive cells in the core. **** Score has been calculated as intensity multiplied by percentage of positive cells. Based on our observations regarding CX3CR1 expression in both normally and abnormally developing keratinocytes, we hypothesized that CX3CR1 may be important for cell differentiation into the epidermal lineage. Thus, we tested the requirement for CX3CR1 in keratinocyte differentiation using a cell culture model. Ovarian teratocarcinoma cell line PA-1 has been established from the ascites of a patient with malignant ovarian teratoma . Chromosomal analysis had suggested that these cells have a heterozygous origin and derived at a stage prior to the first meiotic division . Several studies have shown that PA-1 is capable of differentiation into diverse cell lineages at the appropriate culture conditions [16, 18, 19]. Based on many similarities between the teratocarcinoma cells and early embryonic cells, the former has been used to study processes of differentiation [19, 20]. Using gene specific shRNA constructs, we downregulated CX3CR1 in PA-1 cell line (Figure 2A). Further we cultured both CX3CR1sh-PA-1 and the control cells transfected with a scrambled shRNA construct on Matrigel in the presence and absence of 0.5 nM BMP-4 for 2 weeks. Expression of cytokeratin 14 (CK14) and cytokeratin 18 (CK18) was analysed with immunofluorescence microscopy and Western blotting (Figure 2B,C). We observed that only PA-1 transfected with scrambled shRNA and cultured in BMP-4-supplemented media expressed significantly higher levels of CK14 compared to scrambled shRNA PA-1 or CX3CR1 shRNA PA-1cultured in the absence of BMP-4, as well as CX3CR1 shRNA PA-1 cultured in the presence of BMP-4 (Figure 2B,C). In opposite, scrambled shRNA PA-1 or CX3CR1 shRNA PA-1cultured in the absence of BMP-4, as well as CX3CR1 shRNA PA-1 cultured in the presence of BMP-4 expressed higher levels of CK18 compared to scrambled shRNA PA-1 cultured in the presence of BMP-4 (Figure 2C). PA-1 expressed fractalkine ligand (CX3CL1) necessary for the receptor (CX3CR1) activation (Figure 2D). 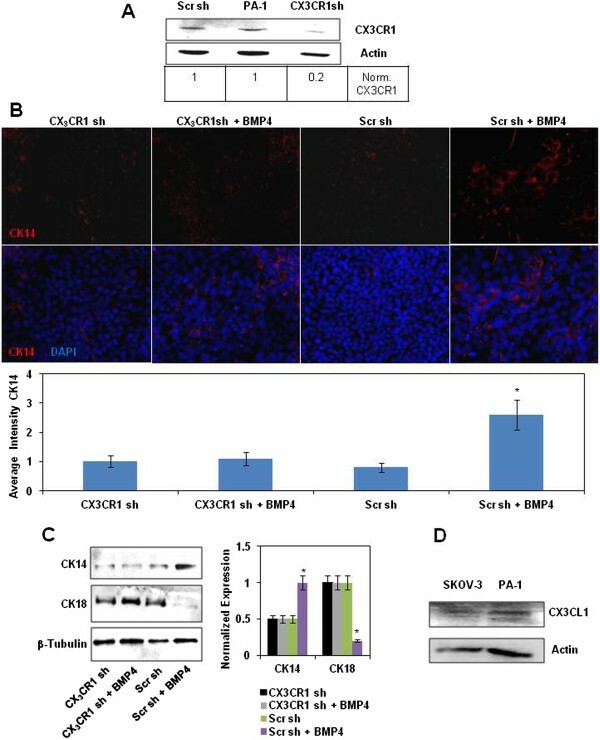 These data suggest that CX3CR1-positive PA-1 cells are able to proceed toward differentiation into skin keratinocytes in the presence of BMP-4 and begin expressing a marker of stratified epithelium CK14, while the loss of CX3CR1 restricts differentiation and the cells remain CK18-positive simple-epithelial cells. CX 3 CR1 is required for keratinocytes differentiation. (A) Expression of CX3CR1 in parental PA-1 cell line and that stably transfected with either CX3CR1 or scrambled shRNA constructs was examined with Western blot. Actin served as a loading control. CX3CR1 expression levels were quantified using digital densitometry and normalized to the levels of actin expression. (B) Expression of cytokeratin 14 in PA-1 cells stably transfected with either CX3CR1 or scrambled shRNA constructs treated with recombinant BMP-4 or vehicle, as indicated, was examined with immunocytochemistry. CK14 in PA-1 was probed with anti-CK14 and Alexa555-conjugated anti-rabbit antibodies, and DNA was stained with 4’,6-Diamidino-2-Phenylindole, Dihydrochloride (DAPI); CK14 – red, DNA – blue. Images were taken using 5× magnification on the objective. The histogram demonstrates the average intensity of CK14 signal across the field as determined by the Zeiss AxioVision software. Data is an average of three independent experiments. *p < 0.05. (C) Expression of cytokeratins 14 and 18 in PA-1 cells stably transfected with either CX3CR1 or scrambled shRNA constructs treated with recombinant BMP-4 or vehicle, as indicated, was examined with Western blot. β-Tubulin served as a loading control. The histogram shows CK14 and CK18 expression levels. Expression of CK18 in CX3CR1shRNA-transfected PA-1 cells was arbitrarily set as 1 and expression of both CK14 and CK18 in other conditions was calculated accordingly. The data represent a typical Western blot image, and quantitative analysis was performed using three independently performed experiments. *p < 0.05. (D) Expression of CX3CL1 in SKOV-3 and PA-1 cell lines was examined with Western blot. Actin served as a loading control. SKOV-3 cell line was used as a positive control. Our findings demonstrate that cells of the skin lineage comprise the most predominant CX3CR1-positive cell type within the specimens of ovarian teratoma. Mature skin is a predominant tissue found in mature ovarian teratomas . Our findings also show that normally developed keratinocytes are CX3CR1-positive. Importantly, our findings suggest that CX3CR1 could be an important player in keratinocyte differentiation. Our data indicate that teratocarcinoma cell line PA-1 expressed a basal keratinocyte marker CK14 when cultured on Matrigel in the presence of BMP-4. In opposite, cells with silenced CX3CR1 and those cultured in the absence of BMP-4 expressed CK18 specific for simple non-stratified epithelium. The role for CX3CR1 in skin differentiation has not been described before, although, the role of this receptor in skin wound healing has been reported . Our findings could be potentially important, as skin is the largest organ of the human body. Many pathological conditions and injuries require regeneration of the skin, and affecting the CX3CR1-dependent pathway could be one way to achieving faster skin formation from cells capable of differentiation. Thus, the studies of the role of CX3CR1 in keratinocyte differentiation need to be expanded further to include more extensive studies on other abnormally differentiating teratoma cell lines, as well as normally differentiating embryonic stem cells. Furthermore, we observed that CX3CR1 is expressed in other developing tissues, as indicated in Table 2, thus, it is possible that this receptor could be important for the development of those tissues as well. In fact, a role for the fractalkine axis in osteoclasts differentiation has been reported, whereby CX3CL1-expressing osteoblasts regulate differentiation of CX3CR1-positive osteoclast precursors . Hence, more rigorous future studies of the role of CX3CR1 in development and differentiation are required. Here we present that fractalkine receptor is expressed by skin cells in specimens of human ovarian teratoma and fetus and is required for epidermal lineage differentiation. This information sheds light on the ovarian pathology, dermoid cyst, and outlines possible mechanisms of cell differentiation within this benign formation. As the fractalkine receptor has recently emerged as a novel potential therapeutic target against many debilitating diseases, it is important to remember its role in cell differentiation when applying future anti-fractalkine therapies. AAKB is a pathologist with specialization in gynecologic oncology. MVB is a basic cancer researcher whose main research interests are on metastatic ovarian carcinoma. Both AAKB and MVB share research interests on the role of CX3CL1/CX3CR1 axis in prostate and ovarian cancers, respectively. LR, AAKB, and MVB have recently co-authored an article describing a role of CX3CR1 in progression of metastatic ovarian carcinoma. This current study seeks to expand the understanding of the biological impact of the fractalkine axis on cell differentiation. Study design: fractalkine receptor is expressed by skin cells in specimens of human ovarian teratoma and fetus and is required for epidermal lineage differentiation. Sources of financial support: American Cancer Society, Illinois Division, grant #198484 (to MVB), NIH National Cancer Institute, grant #1R21CA160917 (to MVB), and Liz Tilberis Award from the Ovarian Cancer Research Fund (to MVB). All authors declare neither financial nor non-financial competing interests. LR analysed CX3CR1 expression in tissue microarrays and interpreted the data. HG analysed expression of CX3CR1 and CX3CL1. AAKB analysed CX3CR1 expression in tissue microarrays, interpreted the data, and contributed to study design. MVB conceived of the study, performed immunohistochemical staining, created stable clones with shRNA, performed immunofluorescence and Western blot experiments, and drafted the manuscript. All authors read and approved the final manuscript.